Three ingredients and a blender – that’s all you need to make this: strawberries, passion fruit and a little touch of maple (or whatever sweetener you’d like). No need for ice cream makers or popsicle moulds here. Just a blender and whatever, large casserole dish that you’ve got on hand and a fork. Nothing fancy, nothing complicated and nothing but noms….I kind of hate myself a little bit for just saying ‘noms’ but you get the point. Basically it’s just an Italian style icy dessert. It lands somewhere between a slushy and a sorbet but with way less sugar and a lot less work. 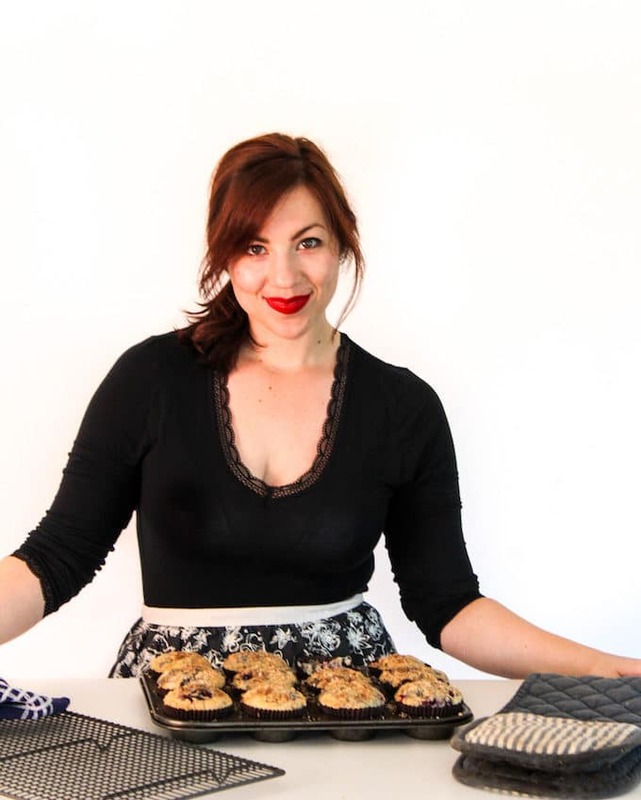 You can make it with any combination of fruit that you’d like so the possibilities are endless…or based on whatever you can find at the grocery store. Either way. I know passion fruit can sometimes be tricky to find depending on where you live so I recommend using kiwi fruit as an easy substitute if you need one here! Start out by adding together your ingredients to a blender or food processor – whichever will work as long as it can blend your mixture into a puree. 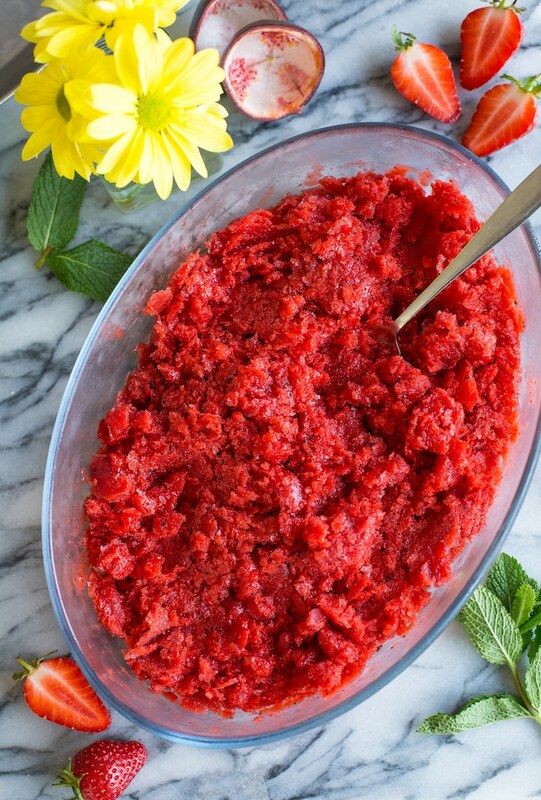 When sweetening your fruit puree keep in mind that food tends to taste less sweet after it’s been frozen so you may want to add just a touch more than you think you need just so it all balances out in the end. I’ve chosen to use maple syrup here to keep this strawberry granita by vegan and low FODMAP friendly, but feel free to use another sweetener of your choosing if you’d like. 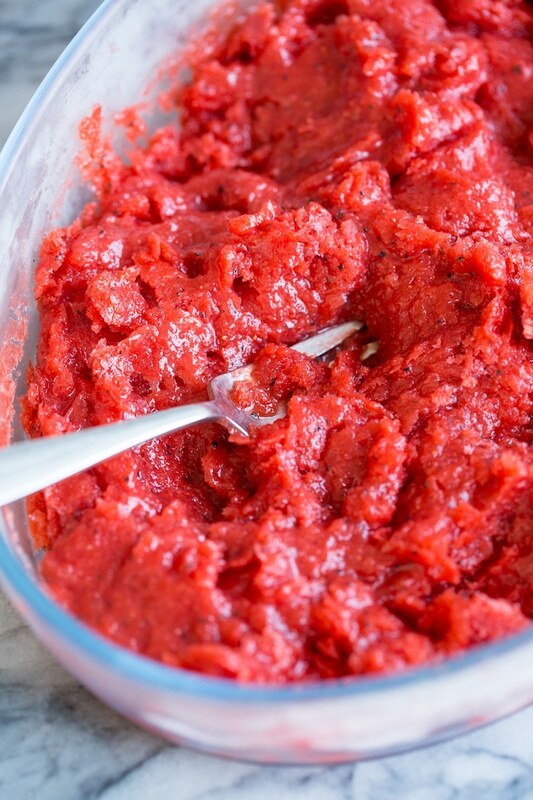 Once you’ve blended your base into a smooth puree you need to pour the mixture out to a freezer safe container. Ideally you want to use a large casserole/cake pan type dish to freeze. Choose something large and shallow to speed up the freezing process. Every hour or so check back your granita and mix it around with a fork. The top and sides will freeze much faster than the rest which is why you need to check back into mix every now and then. Scrape down the sides and break up the large chunks and then pop it back in the freezer. After about 4 hours you’ll be all set to go! 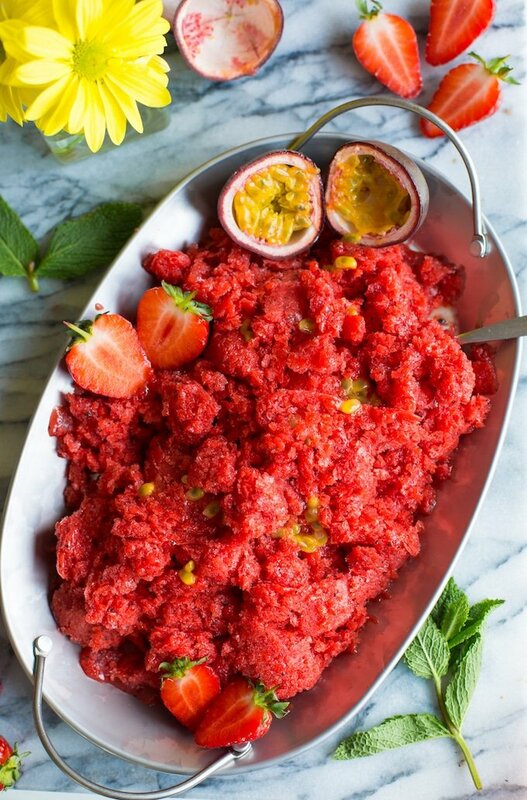 Don’t forget to #asaucykitchen on instagram if you try this Strawberry Granita. I love seeing what you make! You can also post your pictures to my facebook page! 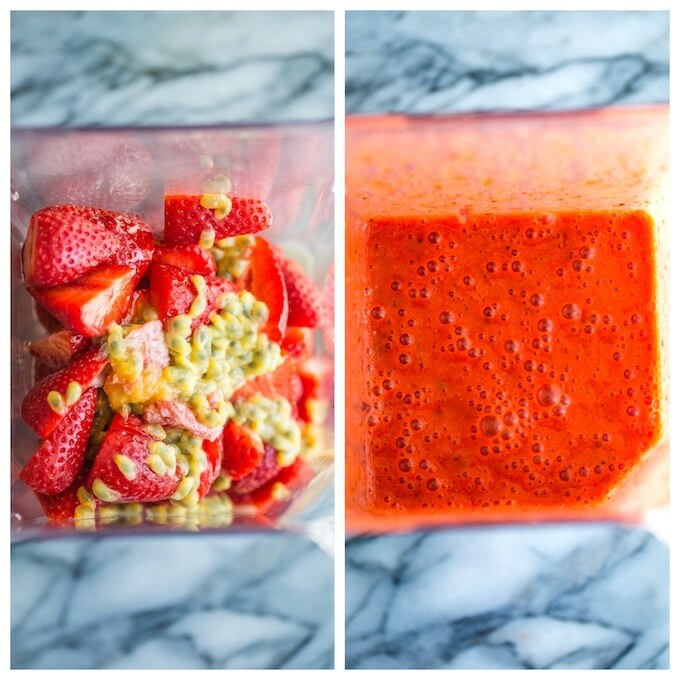 Add the strawberries, passion fruit pulp & seeds and maple syrup to a blender or food processor and puree until smooth. Pour the puree into a large, shallow casserole dish (9x13 inch or larger is ideal). The puree should be no more than an inch deep so that it can freeze quickly. Place the granita in the freezer. Every hour take it out and scrape down the sides with a fork. break up the frozen bits and mix it all around. Return back to the freezer and keep going back every half hour to stir again until completely frozen. In total this will take about 4 hours. When the texture is frozen and flaky it's done. Serve with fresh mint, strawberries, and/or with fresh passion fruit pulp over the top. Looks delicious and so refreshing! I love granita on hot summer days!